Our completely renovated condo offers spectacular finishes with, stainless steel appliances, flat screen TV's, wood burning fireplace and much more. 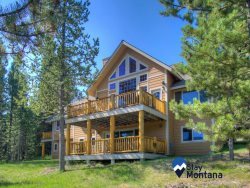 Our condo is a quick 10 minute drive or free shuttle away from the biggest (and best) downhill skiing in the west and conveniently located close to Big Sky Town Center. The living area is an open space concept with a fully equipped kitchen, dining area seating 6 people, breakfast bar, and cozy living room featuring the wood burning fireplace. There are two bedrooms featuring a king size bed and a bunk room with 1 twin bed and 1 queen bed. The master bedroom has a flat screen TV, large closet and en suite bathroom. There is a one car garage and washer and dryer in unit. The community recreation center features a summertime pool and year round hot tub. - Electric Range,Coffee Maker, Mixer, Toaster, Blender, Bakeware, Basic Spices, Trash Bags, Dish Soap, Dishwasher Soap, Sponge, and Paper Towels.